MANCHESTER, NH – The Worcester Railers HC (19-18-3-2, 43pts) closed out a 3-in-3 weekend with a 5-2 loss to the host Manchester Monarchs (22-18-1-1, 46pts) in front of 2,052 fans at the SNHU Arena on Sunday afternoon. The Railers continue their four-game road trip with three games next week in Canada beginning with a 11am start on Wednesday in Brampton vs. the Beast. Nick Sorkin and Tyler Barnes scored for Worcester while Mitch Gillam made 20 saves in net for the Railers before he was replaced by Evan Buitenhuis midway through the hockey game. 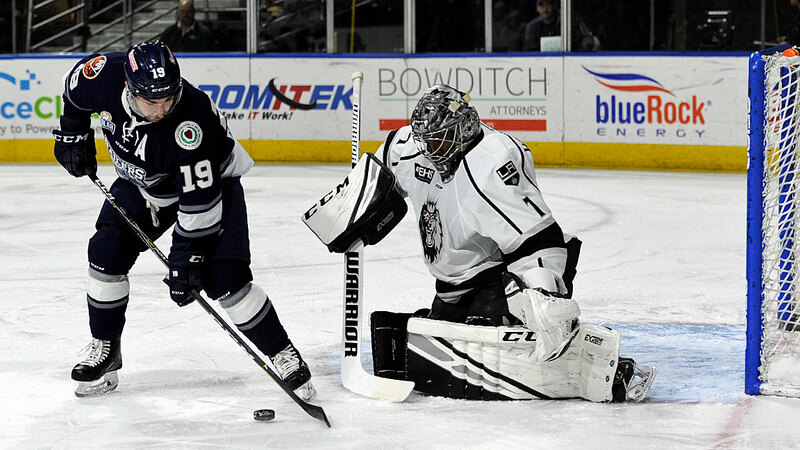 Tony Cameranesi scored twice and added an assist for the Monarchs and goaltender Cole Kehler made 33 saves in net for the win as Worcester fell to 7-11-0-1 on the road this season. With the loss, Worcester now trails the Brampton Beast by three points for the final playoff spot in the North Division. Nick Sorkin (9th) gave the Railers a 1-0 lead at 3:09 as he zipped a quick shot from the right slot assisted by Josh Holmstrom and Matty Gaudreau. But Manchester would counter with a pair of goals as Joe Sullivan (6th) tied it at 4:56 and Tony Cameranesi (11th) gave Manchester the 2-1 advantage at 8:06. Manchester outshot Worcester 17-12 in the opening frame as Mitch Gillam was a busy netminder through 20 minutes of play. Manchester struck three more times in the second period as David Kolomatis (8th) wristed a shot from the center point on the power play at 1:21 and Tony Cameranesi (12th) went bar down at 12:05 which would end the afternoon for goaltender Mitch Gillam. Sam Kurker (6th) gave Manchester the 5-1 edge with a power play score to give the Monarchs a four-goal lead through 40 minutes. Tyler Barnes (12th) gave the Railers a pulse at 5:13 of the third period with a wicked shot from the center slot that went off the crossbar and in assisted by Tommy Panico and Tommy Kelley to get the Railers within three goals. But that would be all the scoring in the hockey game as Worcester outshot Manchester 10-6 in the third period as the Railers fell 5-2. Notes: Three Stars: 3rd star: Spencer Watson (0-2-2) 2nd star: Michael Doherty (0-2-2) 1st star: Tony Cameranesi (2-1-3) …. final shots were 36-35 in favor of Manchester…. Cole Kehler (5-4-0) made 33 saves on 35 shots for Manchester.…. Mitch Gillam (12-11-1) made 20 saves on 24 shots for Worcester through 31:45 before Evan Buitenhuis made 11 saves in relief….Worcester went 0-for-5 on the power play while Manchester went 2-for-5…. Kyle McKenzie (inj), Dylan Willick, Bo Brauer, Alex Vanier (inj), Tyler Mueller (inj), and Malcolm Gould (inj) did not dress for Worcester…. Jeff Kubiak is on recall with the Bridgeport Sound Tigers… the Railers are now 10-11-0-0 all-time vs the Monarchs… Tyler Barnes now has a three-game point streak (1-2-3)…Tommy Kelley has a two-game point streak (0-2-2)….the Railers have not scored a power play goal in seven games. On Wednesday, Jan 30 the Railers battle the Beast on Brampton, ON with an 11am start for a School Day Game. Coverage begins at 10:35am on 98.9 NASH Icon.